A week ago we ran out of mustard. I thought there was another bottle in my pantry, but alas, we were mustard-less. While I'm not a big fan of mustard, hubby likes it on his sandwiches so I wanted to see if I could make it myself. 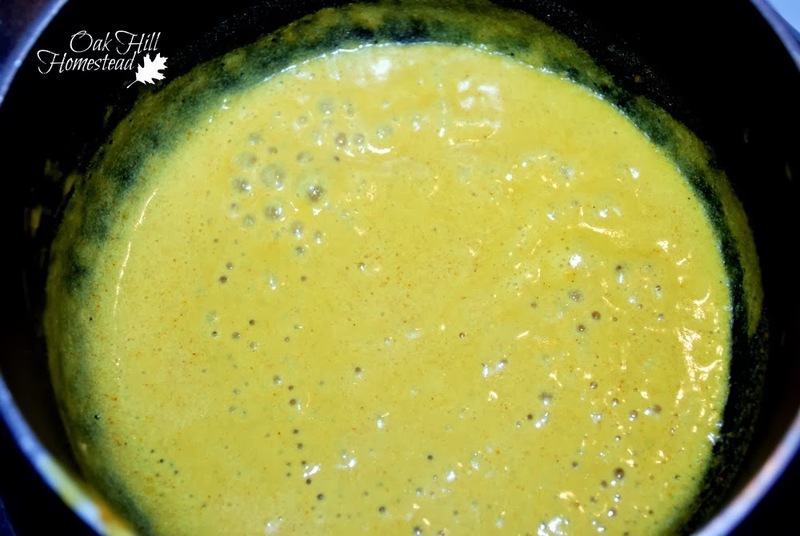 I found a clone recipe for yellow mustard at Top Secret Recipes. Who knew it was this easy? 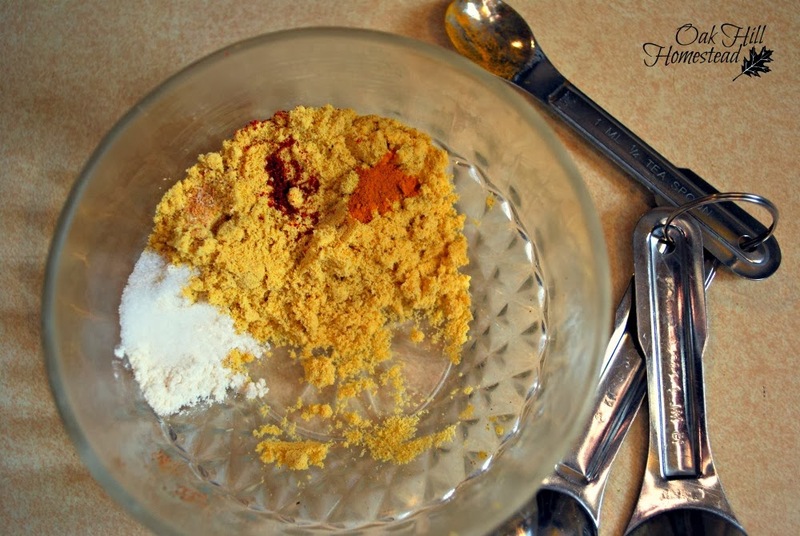 All you need is mustard powder, vinegar, water, flour, salt and pepper, onion powder, paprika and turmeric. I had everything I needed. Yes, that tin of turmeric is pretty old. There isn't much left in it, and I'm glad I have a way to use it up now. I hate waste, even tiny bits of ground turmeric. The recipe tells you that this is a clone of the yellow mustard in the well-known yellow bottle. Of course there are many other types of mustard, including dijon and honey mustard, but I thought this was a good place to start. I told hubby that there are even mustards made from mustard seeds but he said he doesn't want crunchy mustard, so I won't be trying those. Start by measuring all the spices, and combine with the liquids in a small saucepan. This doesn't make a very large amount, so definitely use the smallest pan you have. Whisk it until it's smooth. Cook over medium heat until it boils, stirring often. When it begins to boil, turn the heat down and simmer for 5-10 minutes, stirring occasionally. Five minutes was long enough for mine to thicken nicely. Remove the pan from the heat, cover with a lid, and let it cool down to room temperature. Spoon it into a covered container and refrigerate. Hubby couldn't wait to try it before I took the final photos. He said it was "just like real mustard." This made enough for his sandwiches for a week. 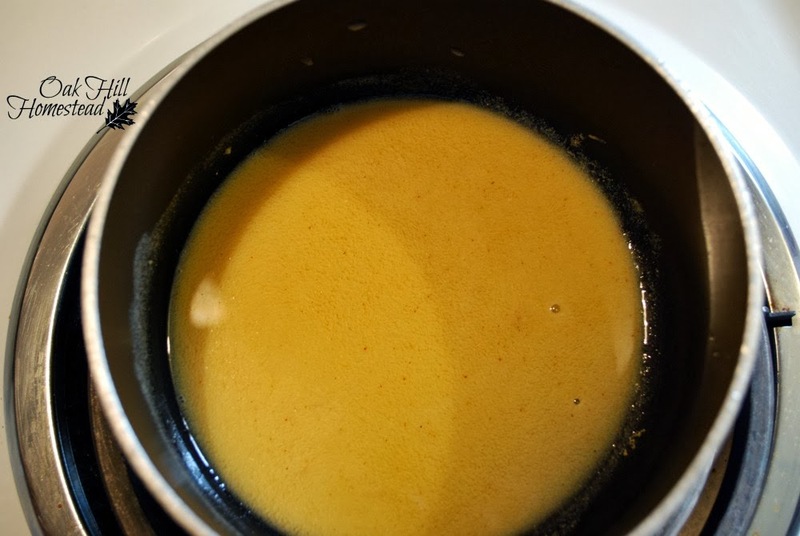 Combine all ingredients in a small saucepan and whisk until smooth. Heat to boiling over medium heat, stirring often. Once it boils, turn the heat down and simmer 5-10 minutes, stirring occasionally. Remove from heat, cover pan with a lid until cool. Store refrigerated in a covered container. Thank you, April, I'll hop over and do that. 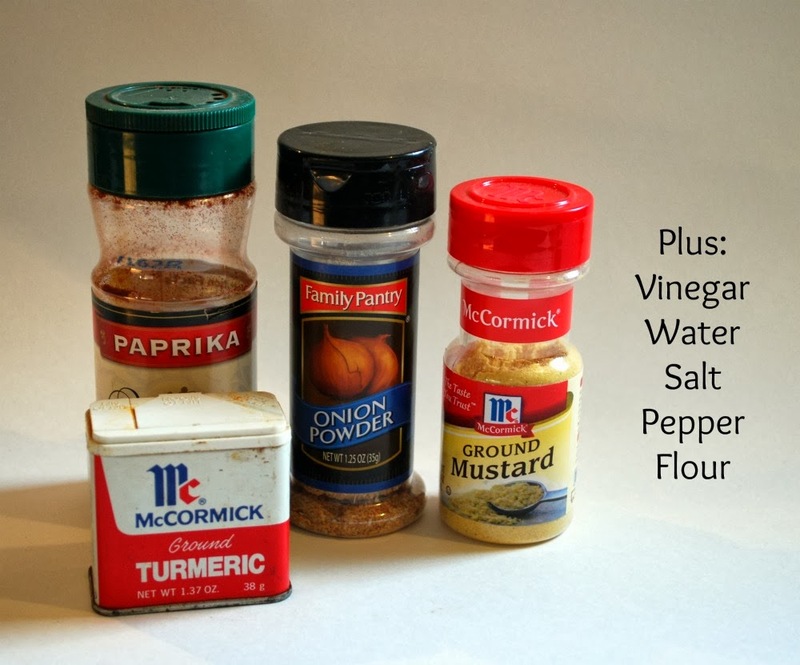 :-) Give this mustard a try, it's SO easy. If you're adventurous, I highly recommend lacto-fermented horseradish mustard. It's a game changer, lol...and not so hot that my 12 year old can't eat it...in fact, she LOVES it. Joy, I was pleasantly surprised at how easy this was. I hope you are brave enough to try making salad dressing soon, let us know how it goes! Kathi, this is great! I have never made mustard and now I am going to have to try it. Thanks for showing me how. You're welcome, Fern. It's nice to know we can make something if we can't get it from the store for whatever reason, isn't it? Great idea - I never thought to make my own, but now I think I will give it a try! Mustard is a great condiment and it's good for you! Apparently tumeric is good for the brain and helps stave off alzheimer's! Thanks for the recipe. Vickie, you're right, I've seen a lot of news about turmeric recently. I'm going to have to buy a new jar of it (mine is old and probably not very potent anyway) and learn how to use it more often. Another mustard for you to try...if you like Chinese Hot mustard. I always hated to buy a bottle of Hot mustard...I mean it just takes a little for one meal. Anyway, it is as easy to make as the one you made and it is always fresh...a little goes a long way. I will be looking for more of your mustard recipes. Thank you, Nell. I'll give that one a try. Yes, I like that making our own means we always have fresh, because the recipe just makes a little. 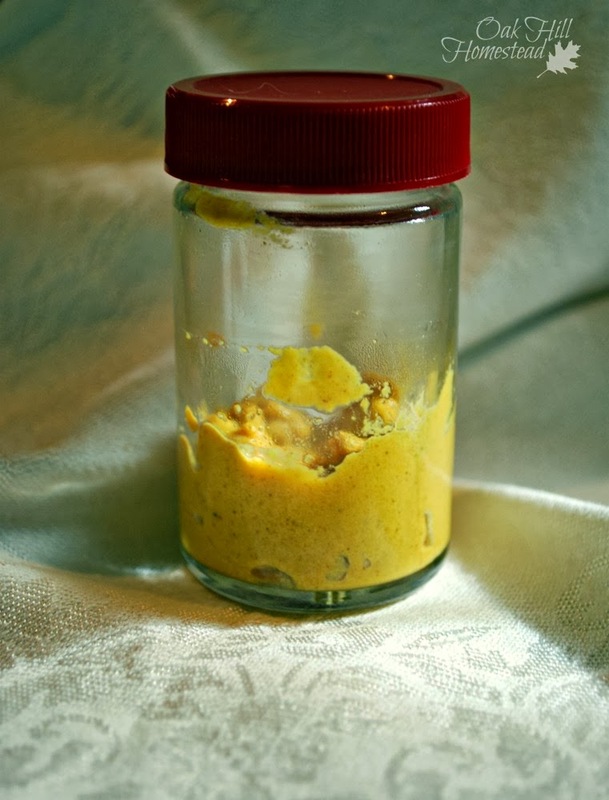 After all, I can't be the only one who's had a jar of mustard in the fridge that is a few years old, right? Hubby is the same way, Sandra. WOW! 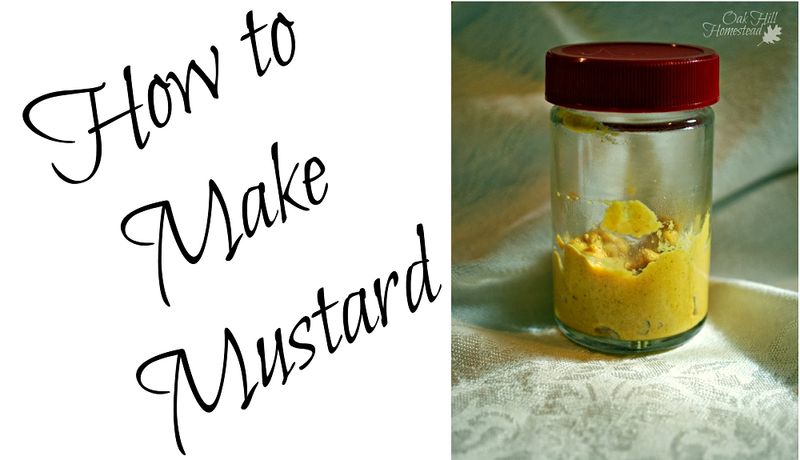 Who would have ever thought you could make your own mustard so easy. I am saving this recipe and the next time I need mustard I will be trying yours. Thanks so much for sharing it with us. That's what I thought too, Tracy! I hope you find it just as tasty and as easy to make. Let me know. I've been wanting to do this and just hadn't got around to finding a recipe yet. I know my husband will be just as excited as yours if it turns out. I found you on the Homesteaders blog hop. Emily, thank you for stopping by. I hope you'll give this a try, and that your husband will enjoy your homemade mustard. I love making my own sauces and condiments, I'm very glad to find your mustard recipe on Chicken Chick's party. I know, who knew? The stores are so full of prepared food that we've forgotten how to make the simple things. Good to know if I ever run out! My first born is a big mustard fan. The recipe I used doesn't make much at a time, you might want to double it or even triple it, but yes, if you ever run out it might avert a disaster! Just think; here I have been growing sweet banana peppers to make and can my own mustard when I could had made it a much easier way. My hubby and I were talking about this a while back and we had no idea! Thanks for sharing! I just love being able to make things from scratch and knowing exactly what is going into my food.